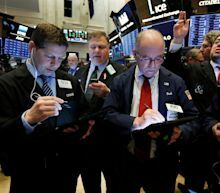 U.S. stocks eked out gains in volatile trading on Thursday, ahead of a long Easter weekend, as strong results from industrials countered another drop in healthcare stocks, with investors shrugging off release of the Mueller report. In a bright spot, U.S. retail sales increased by the most in 1-1/2 years in March, while a labor department report showed the number of Americans filing for unemployment benefits dropped to its lowest in nearly 50 years last week, further underscoring the economy's strength. Details of Special Counsel Robert Mueller's investigation into Russia's role in the 2016 U.S. election were released during the session and showed a series of incidents in which President Donald Trump took actions to impede the probe that raised questions of whether he committed the crime of obstruction of justice.